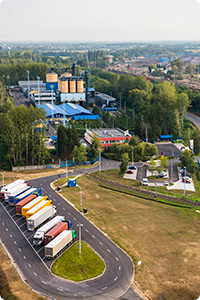 An industrial railway network with wide-gauge (CIS) and normal-gauge (European) tracks, built on an area of 14,5 ha, ensures receiving raw materials arriving from CIS countries in special hopper wagons or packed in Big-bags and crates by trucks on road. The storage of bulk carbon black is realized in 12 storage silos with capacity of 350 m3 each, and in 2 silos segmented structure with capacity of 1300 m3 each suitable for storage of 12 different CB types. Loading- unloading activities are conducted by an integrated control system.